Creation or import of sample lists is done with a few clicks. With one more click sample preparation and data acquisition are started. PAL Sample Control software is the user-friendly tool for the daily routine jobs. 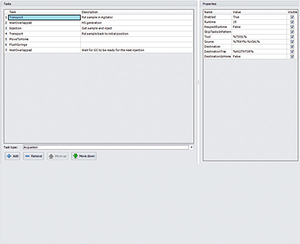 With a few clicks sample lists are generated or imported. Now PAL Sample Control starts the operation and the data acquisition. Since PAL Sample Control Interfaces seamlessly with most of the major chromatographic or MS data systems only one sample list has to be handled. Different user levels ensure process safety. PAL Sample Control optimizes productivity by overlapping individual steps. In many cases runtimes of sequences can be cut to 1/3 or less compared to a sequential procedure. 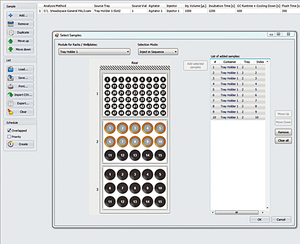 PAL Sample Control allows overlapping of time consuming steps. 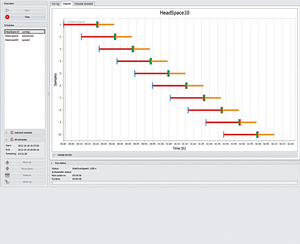 It optimizes automatically the timing of various steps in a sample preparation process and generates a schedule that minimizes the runtimes of sequences. This increases sample throughput greatly and boosts productivity. A powerful yet easy to use tool to generate custom methods is included. While PAL Sample Control is straightforward to use in the daily operations it is also a powerful tool for the generation of tailored methods. A set of tested methods that come with every system (e.g. headspace injection, partial loop liquid injection etc.) can be used as templates and optimized or tailored for specific workflows. Furthermore a large number of building blocks (tasks) for method development are part of the software. These building blocks make it easy to generate new methods, even for complex workflows.